I presume that you live in Europe? If you see souvenirs of the marriage, please let us know. In the meantime, I am sure that Editions saint-paul that has in the past published photographic biographies of the Grand Ducal couple and of the coronation will publish a photographic book of the marriage! I can't wait! No doubt the Cour Grand-Ducale will release pictures of the married couple as per standard of all royal court. However, more personal photos of the couple will not be release until later years with milestones anniversary or birthday. PLEASE let me know if they publish a photographic book...I would love to have one!! By the way, if anybody else sees anything, perhaps from another publishing house, please let us know. There was a book from Editions Saint Paul after the Mariage of Henri & Maria Teresa. And there was a book at Editions Luxnews (pictures Raymond Reuter) at the end of 1981, with pictures from H & MT's first (official) year. So, I tink and hope there will be one this year also. There was a STAMP to! I would love if some official wedding souvenir merchandise was released. Maybe the Grand Duke's / Duchy will display some on its website similar to the way the British Monarchy and Le Palais de Monaco did. ? I got three lovely items from the Monaco Palace website prior to Albert & Charlene's wedding. 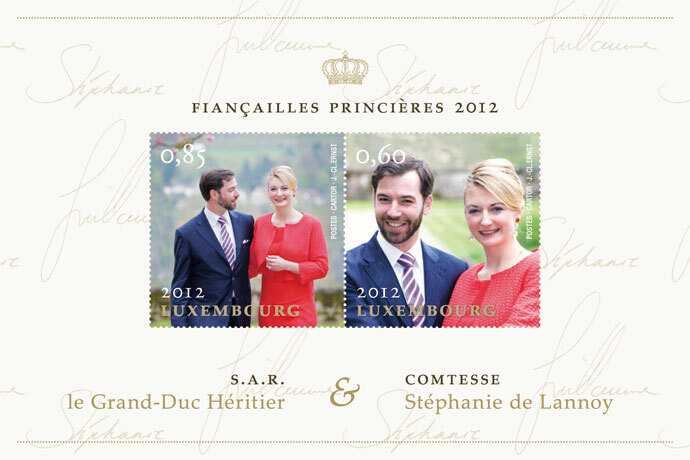 On September 25, 2012 stamps commemorating the marriage of The Hereditary Grand Duke and Countess Stephanie de Lannoy will be issued. The stamp block will feature two photographs of the happy couple from their engagement and their signatures. In the midst of the heartache that Stephanie and those close to her are experiencing, it's just lovely to see these stamps. Their smiles say it all. It was interesting to see photos of the funeral of Comtesse Alix, which are on another thread. Photos from European news agencies. Stephanie looked beautiful in black even though pale from her bereavement. The man I think is her father looked strong even though 90, so if that is the one shown, I expect he will be able to walk Stephanie down the aisle in October. But so much is going on in the world right now, I would feel better if Stephanie and Guillaume married civilly now and she moved into Berg with him at her side. And her father should move too. For comfort, for love, much needed. Mariel I don't think that was Count Philippe today. I don't think he was strong enough to attend his wife's funeral. Guillaume and Stephanie broke my heart today...she looked white as a ghost but so beautiful with that black lace mantilla covering her head and shoulders, clinging to Guillaume for dear life. I wanted to give them both a hug. If they can get through this sad time, they can get through anything. Moonmaiden, if the Count is that frail, I hope there are plenty of relatives to help Stephanie. She does have plenty of relatives but who knows where exactly they are. That is why I thought she might need to move to Luxembourg soon, to have support and love. I would hate to be in that old castle alone with my fiancee somewhere else at this time. It looks like a quaint but desolate place, even the town looks very old and run down. Do you mean Anvaing Castle? I don't think Stephanie lives there the majority of the time. She has a flat in the de Lannoy mansion in Brussels, which I read the other day has been the family's city residence since the 18th century. They use the castle for more formal and family occasions I suppose. Her oldest brother Jehan manages Anvaing and the family properties. I don't think Stephanie will move to Berg full time until after her wedding. I read that she and Guillaume take turns commuting between Luxembourg and Belgium on weekends...she has a suite of rooms at Berg Castle for her personal use, probably likewise for Guillaume at Anvaing. Do you know how many properties the de Lannoys has? I got the same vibe as you did after looking at the pictures (though I didn't know that Stephanie's father was not at the funeral). This experience will either break them or make them stronger, and judging by the way Stephanie clung to her fiance, and the way the said fiance was looking at her, I'd say it's very much the former. The man I think is her father looked strong even though 90, so if that is the one shown, I expect he will be able to walk Stephanie down the aisle in October. I think the gentleman in the photo would be one of Stéphanie's uncles, either maternal or paternal. I know of the mansion in Brussels and of course the very ancient castle, but there could very well be property in France as well. I am not certain. I suspect that her poor heartbroken father was at home, under a doctor's care. From Comité Altstad in Luxembourg, just 200 made! I really hope her father will be strong enough to attend her wedding... otherwise it would be heartbreaking for her ! I really hope Stephanie herself will be strong enough to attend her wedding...I was not prepared for how fragile and completely stricken she looked yesterday. I would think that she, as well as the rest of her family, are still in shock after the unexpected death of her mother. I hope she will be given time to rest and take it easy in the weeks leading to the wedding, I know it's a short time but I think there are those who can help her with any preparations she needs to take part in. The LGDF seems to have taken her to their hearts and I would think that Maria Teresa will do all she can to help her future daughter-in-law in this difficult time for Stéphanie.